Description This 20’x20’ neatly configures into a 10’x20’ as well. Utilizing Lumiture extrusion posts make up this tower with graphics for signage all around. 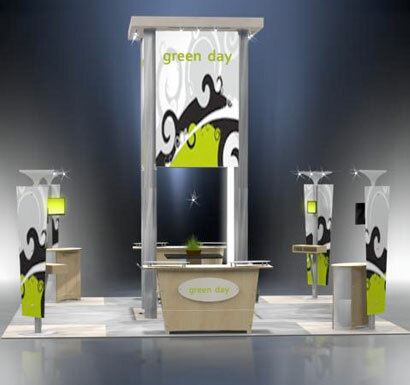 This helps create a nice intimate centrally located conference area. Two nifty kiosks with curved end panels have perfect storage below for CPU’s. Two kiosks are shown for I-pad use also gives you a nice shelf with storage.